Congressman John Rutherford, representing the Fourth District of Florida, embraced the selection of Bass, graduate student at Jacksonville University, as his District Representative. In his second year of the Public Policy Institute’s MPP program, and as a graduate assistant spearheading daily activity at JU’s River House, he first met Rutherford during a political campaigns elective course. Rutherford had come in as a guest speaker, and because of the small class size, Ryan had the opportunity to interact with him afterward. Offering the only graduate-level Public Policy degree in Florida, Jacksonville University’s Public Policy Institute (PPI) is fast becoming the preferred, neutral ground where shapers of public policy meet. 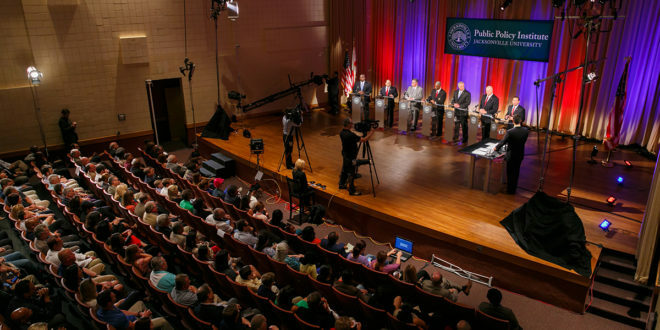 Statewide media website Florida Politics has repeatedly covered the PPI’s televised debates, calling them meaningful. “It is worth noting that, at least in terms of local and regional races, debates held at Jacksonville University have shifted electoral narratives,” the site said. Seven moderated live debates have been hosted on campus in the past two years, something never before done in the University’s 80-plus years. Students say it’s exciting to have this kind of direct access to policymakers, civic leaders, visionaries, elected officials and various local and state candidates—access that PPI has become especially adept at facilitating. The list of special speakers and VIP guests in the five years since the Institute’s inception is as lengthy as it is impressive. Among them: Florida House Speaker Will Weatherford, former U.S. Sen. Bob Graham, U.S. Rep. Ander Crenshaw, Florida Gov. Rick Scott, Jacksonville Mayor Lenny Curry, State Attorney General Pam Bondi, 2012 Republican Presidential nominee and former Massachusetts Gov. Mitt Romney, former U.S. Ambassador to the U.N. Nancy Soderberg, former Ambassador to Saudi Arabia James Smith, Smith’s wife, Janet Breslin-Smith, PhD., and many other distinguished leaders. Modeled after successful policy programs at Duke, Georgetown, William and Mary, George Washington University, George Mason and the Harvard Kennedy School, the PPI is now in its fifth year. Before formally establishing the Institute Where Public Policy Matters JU Shapes Future Leaders & Florida Politics FEATURES BY SHERI WEBBER in 2012, Director Rick Mullaney visited and studied these highly respected institutions. “We adopted some of the best practices across the country, adding it into the two-year program. The result has been the first Public Policy Institute of its kind in Florida and an extraordinary first few years,” says Mullaney. Not only does the Institute award the unique MPP degree, a very different animal than an MPA, along with other dual degrees, it also serves as a hub for town hall meetings, policy forums, polling, guest lectures and rolling commentary through social media, local television and radio, and through “Policy Matters,” hosted by the Institute and aired quarterly on NPR member station WJCT. Jacksonville University and the Public Policy Institute are strategically placed in Florida, which has historically played a pivotal role in national politics. Only once since 1964 has Florida not chosen the winning presidential candidate. In addition, the Sunshine State is incredibly competitive when it comes to presidential or gubernatorial elections, with victors often walking away with only a one percent lead in votes. Florida has only 10 media markets and Jacksonville is ranked No. 47 on the list of top 100 media markets across the nation, according to Nielsen data from 2016. The religious composition of Florida also more closely aligns with that of the country as a whole, more so than any other state. Lastly, Florida’s Constitution allows for revision through a regularly scheduled commission that convenes every 20 years: the Constitutional Revision Commission. The PPI is no stranger to the unusual qualities of its home state and leverages those identifiers to provide students with real-world experiential learning. Through an active collaboration between the University of Florida’s Bob Graham Center for Public Service and the PPI, a memorandum of understanding was formalized last September and includes sharing expertise through internships, publications, scholarships and events, such as the 2017 Annual Future of Florida Summit. The theme at this year’s Summit was the role of the Constitutional Revision Commission, and JU students placed in the top two teams that submitted proposals for constitutional changes. Among the only master’s-level students attending, JU students helped prepare the winning two amendment proposals, suggesting that voters 1) increase the mandatory retirement age of judges, and 2) close the infamous write-in candidate loophole that has frequently wreaked havoc in elections across the state since its creation in 1998. The Institute’s identity as a neutral site for policy discussion continues to expand. “PPI is becoming the central address in North Florida, as well as the state, for matters of importance in public policy,” says Richard Sisisky, founding chair of PPI and President of The Shircliff and Sisisky Co., a management-consulting firm based in Jacksonville. Sisisky and Mullaney are not alone in their mission to create a better future for Florida through its graduates. The Institute’s 25-member Board of Advisors includes civic and community influencers such as Crenshaw, former Congressman Jason Altmire, JAXChamber President Daniel J. Davis, former Jacksonville Mayor John Peyton, Jacksonville Jaguars President Mark Lamping and Community Foundation for Northeast Florida President Nina Waters. Preparing students for leadership roles in public, private and non-profit sectors remains a priority for the Board and the faculty. “Here, we believe that policy matters, and we know public policy has the power to shape not only cities and states, but also the future of our nation,” says Mullaney. The belief that PPI is the premier nonpartisan choice for meaningful discussion on the issues facing citizens today is shared by more than its director. In fact, more instances of organizations seeking out the availability of the Institute happen every academic year. In February 2013, Scott utilized JU as a community gathering point for a newly launched health care initiative. In summer 2015, Curry and his mayoral transition team reached out to the PPI, and after his election to office, Curry held one of many community conversations at JU regarding expansion of Jacksonville’s Human Rights Ordinance. One visitor who sparked a great deal of interest when he approached PPI about hosting a town hall was 2016 Libertarian Vice Presidential Candidate and former Massachusetts Gov. Bill Weld. “No matter how hard your questions get tonight, this is a high point for me, and I have to agree with Rick Mullaney that policy does indeed matter,” Weld said just 47 days before the November election. The evening included a moderated roundtable discussion on issues ranging from the national debt to immigration policy. “I consider the MPP Program to be the most innovative, policy-centered program in the state. Thanks to Rick Mullaney’s vision and dedication, as well as the incomparably influential and diverse board he compiled, I knew it was where I needed to be,” says John Horne, a current MPP student also pursuing a Juris Doctorate. Horne heard Weld speak that evening, and said he considered it one of the more thrilling experiences of his college experience to take part in a roundtable discussion with Weld. “It was truly surreal to receive career advice from a man coming from the perspective of one of the oldest, most esteemed families in American history,” Horne said. With his own share of political family background as the son of former Florida Education Commissioner Jim Horne, John Horne is currently the top student in his class at Florida Coastal School of Law. Soon he’ll join the few who have earned the dual MPP-JD degree, first conferred in Florida in 2015 at JU. The MPP curriculum and PPI faculty seek to provide students with the substantive knowledge to lead and succeed in policy-related careers. Providing the analytic, quantitative, communication and management skills so fundamental to transformational leadership is also an enormous part of the goal, in particular, for those professors involved in the founding of the Institute. Dr. Erich D. Freiberger is one of those founding voices and continues to teach in the program, lending his expertise in ethics and philosophy. According to Ryan Bass, being the third largest state in the nation while also being a swing state means Florida is frequently thrust into the forefront of political discussion. “As the only graduate-level public policy program in the state, the Institute showcases Jacksonville on the national stage,” he said. “If you want to engage with local leaders, officials in Florida, or at the federal level for that matter, JU is the place to be. Just remember, public policy is intertwined into every industry in the U.S. – healthcare, education, taxation, safety, etc.